The Kansas City Royals just bolstered their outfield. The Chicago White Sox traded outfielder Melky Cabrera to Kansas City on Sunday for two prospects and cash considerations. Cabrera is making $15 million this season and is scheduled to become a free agent after this season. Chicago received right-hander A.J. Puckett and left-hander Andre Davis from Kansas City. Davis is the 13th-ranked player in the Royals’ farm system and Puckett is ranked 22nd, according to MLB.com. This season Cabrera is batting .295 with 13 home runs and 56 RBIs in 98 games for Chicago. Davis, 23, is 5-4 with a 4.83 ERA in 18 starts for Lexington, the Royals’ Class A team. Puckett, 22, is 9-7 with a 3.90 ERA in 20 starts for Wilmington, the Royals’ advanced Class A team. Cabrera, 32, returns to Kansas City, where he played in 2011. You have to give the front office of the Chicago White Sox credit. GM Rick Hahn and PBO Kenny Williams are pulling out all the stops with a number of huge trades to make the White Sox a force once again, something that hasn’t been the case for some time. Although this is coming at the sake of the team’s present, South Side baseball fans should be quite pleased with the team’s commitment to being a contender again. Every deal has bolstered the White Sox farm system with a number of big name youngsters. It all started with a bang back in December. 12/6/16- Chicago sends LHP Chris Sale to Boston in exchange for no. 1 prospect 2B Yoan Moncada, no. 11 prospect RHP Michael Kopech and others. This trade took the MLB by storm. Though Sale had been a trade rumor for months by this point, the deal was still a shock because of the magnitude. Not a lot of people foresaw the lefty going to one of baseball’s biggest markets in exchange for two of the best prospects in the game. Chicago said goodbye to its longtime ace, but gained two possible franchise cornerstones in return, five-tool infielder Yoan Moncada and flamethrower Michael Kopech. But that wasn’t the end of it. A day later, even more gas was poured on the hot stove. 12/7/16- Chicago sends OF Adam Eaton to Washington in exchange for no. 7 pitching prospect Lucas Giolito and no. 36 prospect RHP Reynaldo Lopez. Although this move was a head-scratcher on the Nationals’ behalf, it was gold for the ChiSox. Lucas Giolito’s value on the Pipeline has waned a bit recently, but no team will look a 23-year-old who sits at 95 MPH in the mouth. Lopez, also 23, possesses a wicked curve to go with his heater. All this for the price of a light-hitting outfielder. I’m sorry Washington, but come on, what were you thinking? That was it for the time being and it looked as if the team may have been done. But Hahn has picked it up again in the last week and a half. 7/13/17- Chicago sends LHP Jose Quintana to Chicago Cubs in exchange for no. 8 prospect OF Eloy Jimenez, no. 63 prospect RHP Dylan Cease and others. Eloy Jimenez bats for Team World at the 2017 All-Star Futures Game. Photo by CSN Chicago. After Chris Sale packed his bags for Boston, the Pale Hose’s next best pitcher was fellow lefty Jose Quintana, fresh off an All-Star 2016 season. Seeing more bait, the team sent their ace to the other side of the Crosstown Classic, the Cubs. In return they received 20-year-old Eloy Jimenez, the 2013 international pool’s biggest name. While not a power hitter, the Dominican has great bat speed and has tore up Single A+ this year. Dylan Cease falls lower on the Pipleline, but sits anywhere from 94-98 MPH despite Tommy John surgery. Who wouldn’t love that in their farm? Then, just Tuesday night, another blockbuster. 7/17/17- Chicago sends 3B Todd Frazier, RHP David Robertson and RHP Tommy Kanhle to the New York Yankees in exchange for no. 30 prospect OF Blake Rutherford, RHP Tyler Clippard and others. Blake Rutherford is now one of three young White Sox outfielders on the Pipeline. Photo by Minor League Baseball. 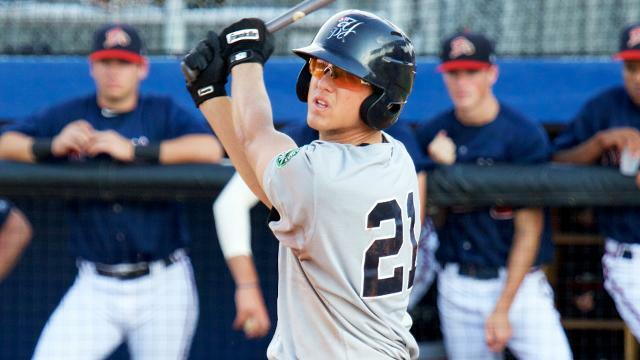 Adding 20-year-old Blake Rutherford to the farm gives the ChiSox another potent young bat. A lefty, Rutherford has made all the teams that overlooked him in the first round of the 2016 Draft look stupid. His smooth swing and smart eye make him an outfielder than can hit for both average and power. He will fit very nicely with Moncada and Jimenez. It seems that the White Sox may be done after this move. The only players remaining on their roster that would be appealing to suitors are Jose Abreu and 2017 All-Star Avisial Garcia. There are always a couple players that are untouchable during a rebuild to keep some kind of foundation in place. With no rumors around either player, it appears that they are staying. With all these blockbusters designed for the future, it’s safe to say the Pale Hose won’t be contending any time soon. But, when all the players they got in return are ready for the big leagues, the Chicago White Sox are going to be one scary team. Early Wednesday morning, just as clock passed 12:00 am, the New York Yankees and Chicago White Sox pulled off a 7-player blockbuster trade that showed just how shrewd the Yankees trade practices have been in recent years. The Yankees, in dire need of bullpen help and production from 1st base, sent struggling reliever Tyler Clippard along with Top 30 prospect Blake Rutherford and other prospects including Ian Clarkin and Tito Polo to the Chicago White Sox in exchange for 3rd baseman Todd Frazier and relievers David Robertson and Tommy Kahnle who are both turning in career-years. Not only do the Yankees gain some significant help for their recent bullpen ails and 1st base bat production woes, but they also get some stability. Coupled with the fact that New York didn’t have to heavily dip into their uber-talented and deep pool of prospects to pull off a blockbuster deal this makes their trade with Chicago that much more impressive. Flexibility is key as the Yankees can move Todd Frazier to 1st base to give that position more production. Although Frazier has struggled this season he is one year removed from a 40-homerun season and he has come on strong recently. Frazier is also a rental as his contract expires at the end of this season. His arrival gives the Yankees flexibility at 3rd base with Chase Headley who has had a decent, not great season. The Yanks could shop Headley ahead of the deadline. Robertson, 32, who is posting a 2.70 ERA and 4.3 strikeout-to-walk ratio in 31 appearances, returns to the Yankees where he spent several seasons and should significantly upgrade a shaky bullpen. Robertson is under contract through 2018. Kahnle, 27, is tossing an impressive 2.50 ERA in 37 appearances at a 8.6 K/BB ratio. Kahnle’s contract is club controled through 2020. The deal adds an additional layer of happiness for the Yanks as the Boston Red Sox were close to working out a deal to acquire both Robertson and Kahnle before New York came in and outbid them. While Rutherford is a tough prospect to part with, the Yankees can rest assured that they gave up far less in this deal than they might have chasing the likes of Oakland’ Sonny Gray in what was another rumored blockbuster being negotiated. That deal may still be being discussed but with the Yankees filling a hole at 1st base it may come down to just talking about Sonny Gray which could lower any asking price the A’s may have.